There is no escaping the idea that RAGE 2 feels like developer id Software’s 2016 banger, DOOM — and that is a good thing. Despite plenty of open-world, post-apocalyptic shooters rolling out within the year, RAGE 2 feels entirely it’s own with an exciting twist to gaming in a gigantic landscape: rapid, unrelenting, and up-close and personal combat. Earlier this month, DualShockers got to spend some one-on-one time with a pre-beta build of Rage 2. Starting at an early part in the game, we took the controller and were let loose on the world. Playing as Walker 30 years after the original RAGE‘s asteroid hit, there were no limits or boundaries in where we could or couldn’t go. The game is recognizably a marriage of developer Avalanche Studios’ world-building and physics and id Software’s combat logic. It’s awesome. For those of you who have never played RAGE before (I was one of them), you don’t need a base knowledge to dive into the standalone title. RAGE 2 has the feel of DOOM mixed with a similar setting and humor of the Borderlands series (notably without multiplayer). Dissecting that note, all combat is in your face–Nanotrite abilities like creating a swirling plasma vortex, maintaining a deadly laser wall, and slamming into the ground require you rushing into combat. Meanwhile, aiming down sights for your massive guns never offers range–it creates variable versions of each weapon that cause varying amounts of damage or abilities. I’ll be honest and say that this is perhaps jarring, and it isn’t entirely RAGE 2‘s fault. First-person shooters, most notably open-world FPS games, have conditioned us to focus on range, sniping, and distance. Stripping that away from players is a sacrifice of comfort and safety; don’t expect to be able to take pot-shots at an enemy from across the map. But once you throw off the shackles of traditional FPS design and approach the game more like a hack-and-slash action title with guns, everything clicks. You are racking up combos, ground slamming enemies and shotgun firing them into explosive barrels. It was only about an hour in when I started combining these Nanotrite abilities into a ballet of bullet-flying, neon-based combat and boy was it satisfying. And though this is a unique take on open-world game design, it isn’t without its flaws. 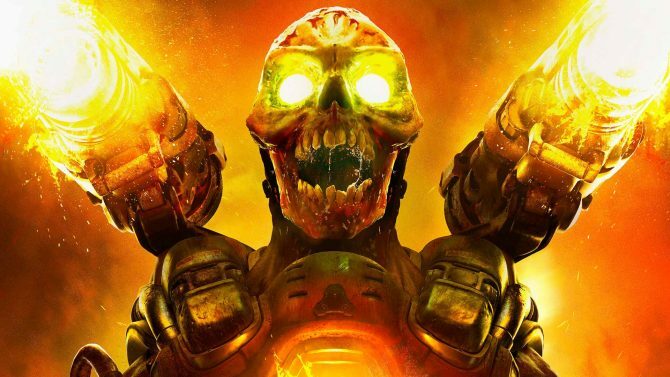 Specifically comparing it to 2016’s DOOM, we can see the cracks in the plan. 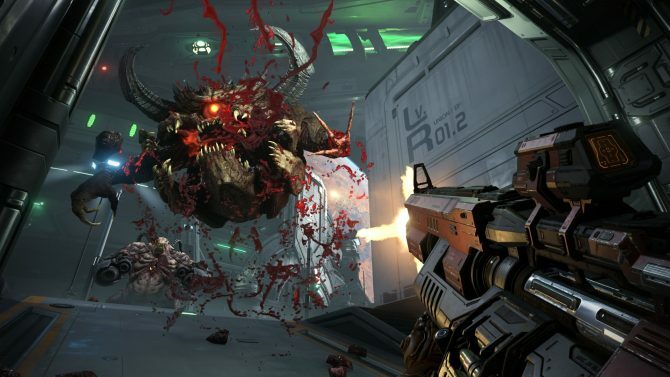 DOOM and its fast-paced combat is often praised, but a big part of that comes from the pre-designed narrow arena-like maps that the game uses. It’s easier and perhaps more natural to take on a dozen enemies in a locked underground laboratory with little room. Meanwhile, the landscape to RAGE 2 feels like it may hurt gameplay — the best moments of gameplay came in situations where there was more limited mobility, like when I was taking part in arena-like deathmatches to win the favor of a cantankerous bouncer. On the other end, I can see developer Avalanche Studios making use of the open space, offering more mobility options that amp up gameplay. But in my short preview session, I couldn’t master the gameplay enough to find out which camp this leans into. The world itself has the personality of Mad Max (conveniently another Avalanche-developed title) and the currently-dormant Borderlands series. On the one hand, the world is tough, machismo, and gritty. The weak aren’t surviving in post-apocalyptic Earth, and most people are actively devolving into their worst traits–the sadists and masochists rule the world in a barely-contained society. But that isn’t to say the world is bereft of humor and variety–the world is anything but brown and drab, with heavy highlights of neon to offer visual diversity. In my hour or two of gameplay, I got to meet a Guy Fieri-like club owner with insidious plans for the city, an indulgent past-prime television host that was an equal fan of blood-lust and orgies, and a racecar driver that was really insistent about getting in my pants. Despite the serious world, RAGE 2 doesn’t take itself too seriously and has plenty of callbacks to other media points that inspire it. Unlike DOOM, Avalanche’s title makes waves by throwing in diversity in actual gameplay–you aren’t always wandering around shooting monsters or soldiers. I spent a good chunk of my time just exploring the in-game city, talking to some of the city’s survivors, and taking part in some drag-racing for clout. Meanwhile, the more gun-based gameplay also comes with different scenarios and twists. While I spent a substantial portion in objective-based missions, I also hit checkpoint to checkpoint on the map, “liberating” gas stations and reinforced outposts with an iron fist and blazing shotgun. Other times, I was taking on War of the Worlds monolithic bots, dodging and sprinting from lasers within an abandoned town. 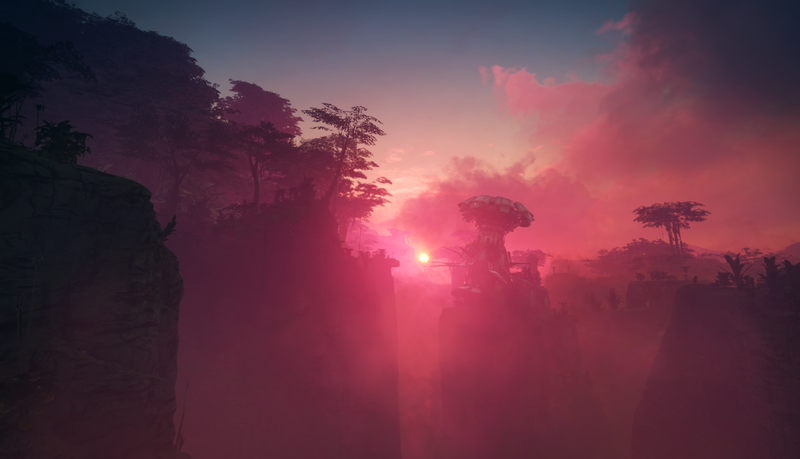 I haven’t seen a fraction of what RAGE 2 has to offer, but I’m expecting a veritable playground of death and mayhem. 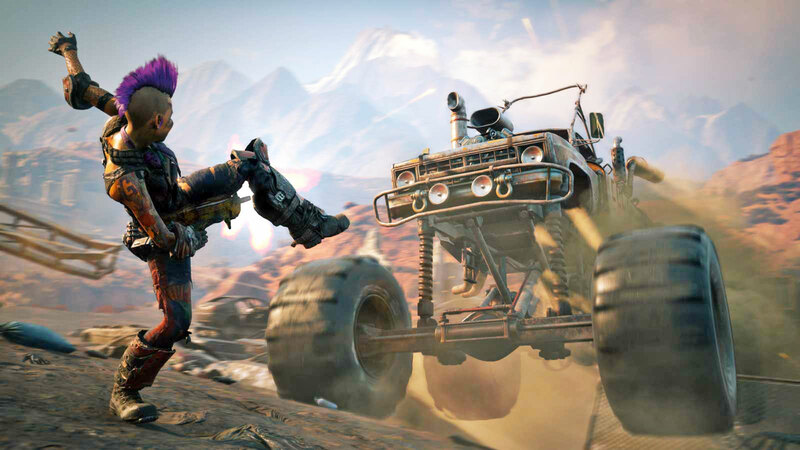 RAGE 2 is incomparable with other post-apocalyptic games coming out this year, and looking to shake up the formula. 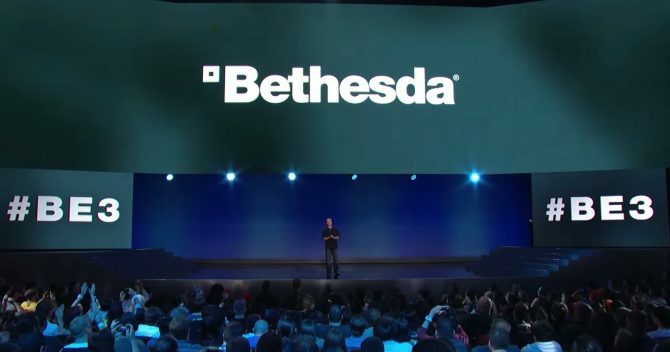 Merging open-world gameplay with break-neck close combat action, the game will scratch a DOOM itch while we wait for DOOM Eternal. However, Avalanche Studios is setting up to evolve how we look at combat in a modern open-world FPS, and you should be excited. 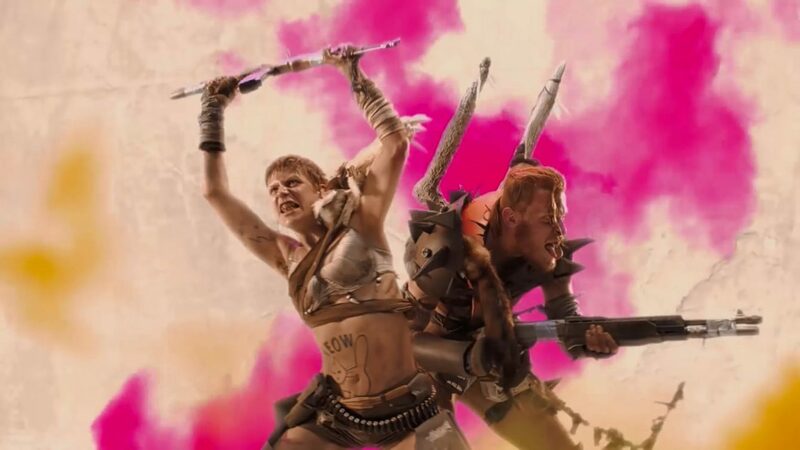 RAGE 2 is coming to PC, PS4, and Xbox One on May 14, 2019. Anyone looking to take the post-apocalyptic dive can pre-order the game on Amazon, or the special edition version if you want a mutant head. Seriously.